I started out as a help desk intern at a civil engineering company in college. As I proved myself capable, the systems admins at the company Josh Atwell (@Josh_Atwell), Brandon Sabol (@bmsabol) and Jamey Westmoreland taught me a bit about VI3 and I fell in love with the technology. I started trying to learn as much as I could about it while I was there. Unfortunately the economy hurt that civil engineering company quite a bit and I moved on to greener pastures that didn’t involve VMware as much as I would have liked. I eventually went to work with Brandon and Jamey again as a Systems Administrator at another company where I really tried to focus on VMware vSphere. At this company they also introduced me to this cool technology called VMware View. I saw the huge benefits that VDI gave to the business and combined with my end user facing background, I saw this as a great intersection of two passions of mine: end user support and VMware virtualization. From there I moved to Varrow who is a VAR in the Carolinas where I narrowed my focus on implementing and designing VMware View and vSphere technologies. I was surrounded by brilliant people at Varrow who are always willing to invest time in others. These co-workers at Varrow significantly grew my abilities and pushed me to pursue excellence. 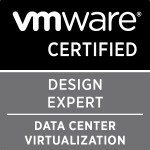 I passed my first VCP in 2011 but when I really started focusing on the VCDX and told my boss I was going to pursue it was in January 2014. At that time I already had the VCAP-DTD I think. So I’d say about a year and a half from first VCAP to VCDX. DO IT. It’s not an easy process but you learn SO much throughout the process. I now look at projects more holistically than before. Don’t worry about the outcome as much, just focus on the experience you are gaining along the journey. I would do more mock defences and do them earlier. I actually had to go through the defence process twice before I passed. The first time around, I was told to wait to do mocks until after your design was accepted. In my opinion, this was bad advice because after my design was accepted, I started doing mocks and found holes in my design which I believe contributed to me failing my first time. Once you submit that design document, there is only so much you can explain during your defence. Do mocks before you submit to ensure that the design is solid. Varrow strongly encourages us to pursue certifications and grow professionally so they were very pleased with the news. All of my co-workers have been very supportive and congratulatory of the certification as well. I would say it was absolutely worth the effort. Personally, it validated my skill set and boosted my confidence after not passing the first time. Professionally, I feel like I am able to offer a more holistic solution for our customers and the certification gives me instant credibility. Categories: Certifications, Virtualisation, VMware | Tags: VCDX, VCDX Spotlight, Virtualisation, VMware | Permalink.